Missed our Day 2 recap? Catch it here! 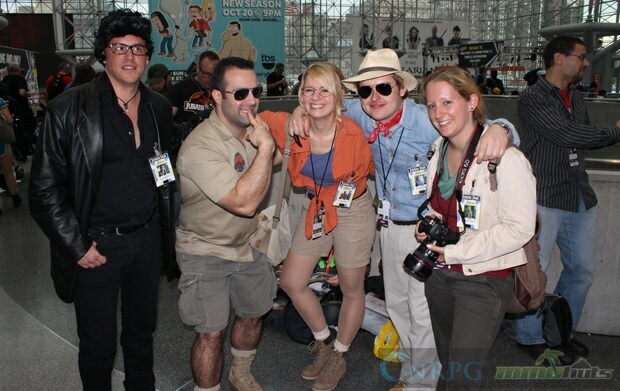 Today was easily the roughest days I’ve had covering NYCC so far. From exhibit to exhibit, I and my team spent almost the entire day doing back-to-back interviews with a few toy vendors and game companies on various products. The biggest interviews on the list include details on the upcoming Dragonball Xenoverse, Brave Frontier and a personal interview with the devs behind the upcoming Killing Floor 2. So many interviews, so little time! 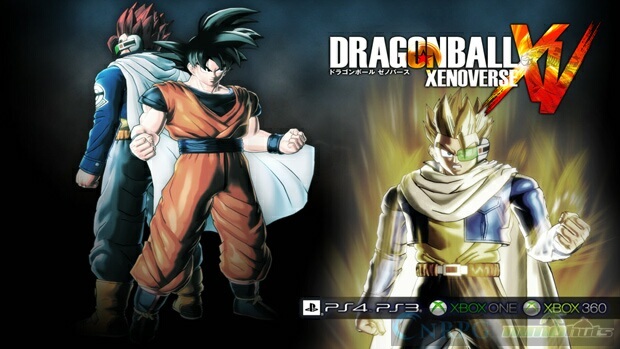 So first up was Dragonball Xenoverse, a new kind of DBZ fighting game with a unique online mode that will set it far apart from previous DBZ titles. Here, players will create a custom character to star as the main hero of game, and will be tasked by Trunks to fight against several evil doers that are attempting to take over the universe by altering many famous events in Dragonball history. 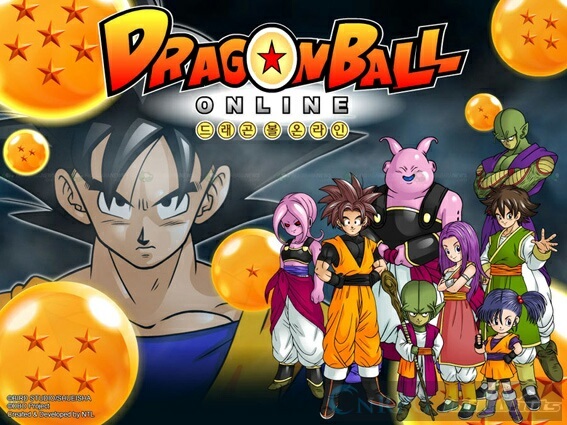 Yes, it was a bit too much of a hardball question, but the localization producer answered honestly by saying that it’s the biggest online Dragonball game in western territories, as the game features an online hub world (PSO style) where players can meet up, form groups, grab quests and go on co-op or competitive missions together. Mix in the freeform tenkaichi-style combat, tons of custom character options and even 3-on-3 battles and Dragonball Xenoverse gives off the potential to be one of the best DBZ games to date, so it’s definitely on my watch list. Next up was an interview with Gumi Corp and their ever-popular F2P mobile/tablet RPG: Brave Frontier. Despite this game having so much popularity in the F2P mobile gaming scene, their presence at NYCC was the first time I had ever heard of the game, but I wish I had heard of it sooner, because I really enjoyed the game’s visuals, since it reminded me of Valkyrie Profile and other old-school JRPGs. 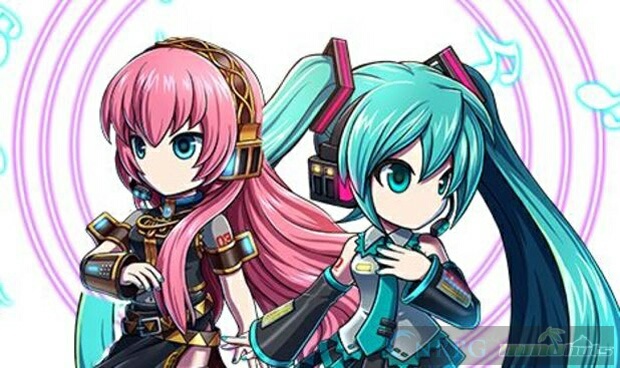 The main reason the game was being shown off at NYCC was to promote their new event dungeon, as well as a promotion for Hatsune Miku and Luka as playable characters in the game. While I decided to do the interview with them, I felt like I could have asked a few more hard questions regarding how balanced it is from a F2P standpoint, but instead the meeting as a whole stayed very simple. Plus, I ended up saying “awesome” after every response the interviewee gave me, which made me feel pretty silly by the end of it. Oh, but guess who I ran into once more? 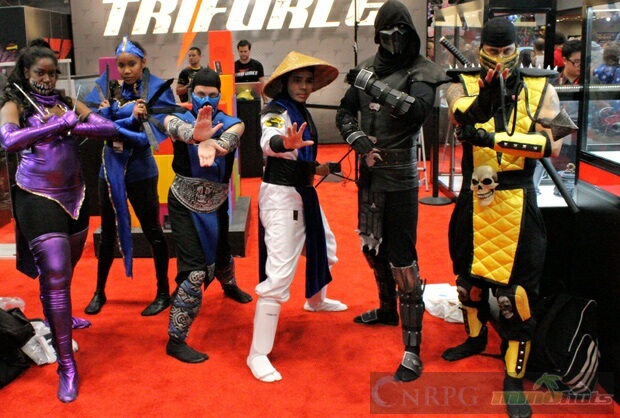 It’s the MK Scorpion cosplayer from last year’s comic-con, and this year, he’s brought some friends along with him! 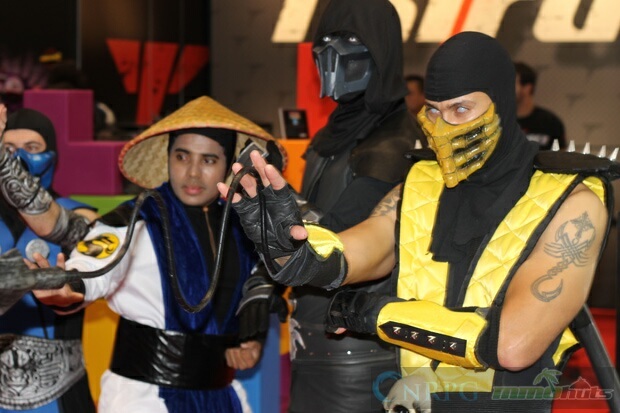 This guy is easily one of the most convincing Scorpion cosplay outfits right along with that Sub-zero outfit. 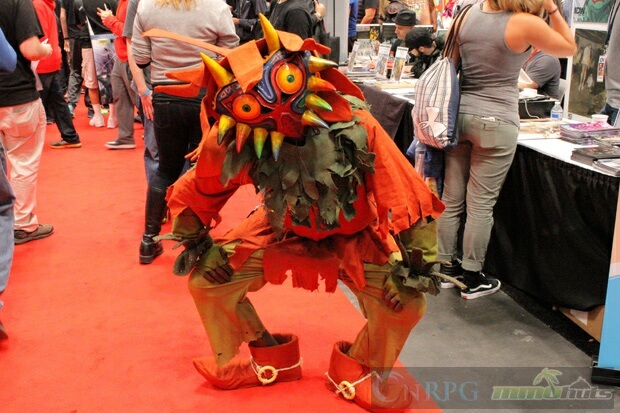 Now if only I could see those two cosplayers together, it would have made my day. Last up for interviews was an exclusive look at the upcoming action/horror FPS title: Killing Floor 2. NYCC 2014 was the first time they have ever shown live gameplay footage for it and despite the fact that it was being shown in an early alpha stage, the game looked incredibly polished. The footage shown off was under embargo, so no one was allowed to take pictures or shoot footage. A lot of new systems were shown off such as the “meat system” which allows all zed bodies to be dismembered in various ways. There’s five dismemberment points in the head alone and up to 24 points in total. It’s so detailed that players will even be able to identify organs! 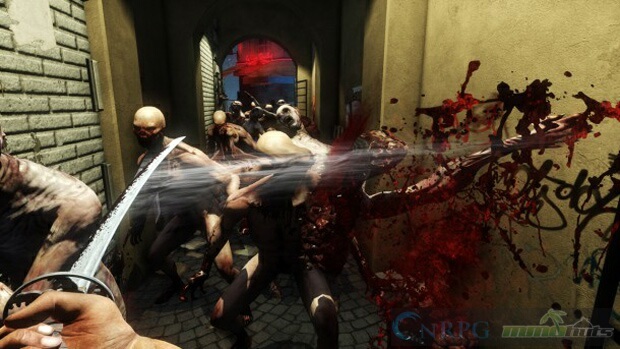 My friend was a huge, diehard Killing Floor fan, with well over 600+ hours logged into the game, so he took the reins on the interview and asked a lot of serious questions, such as game’s connection with the previous Killing Floor game, the new visuals, gameplay changes and more. Overall, the interview went really well, and at the end we were given some great parting gifts, including some DOSH. 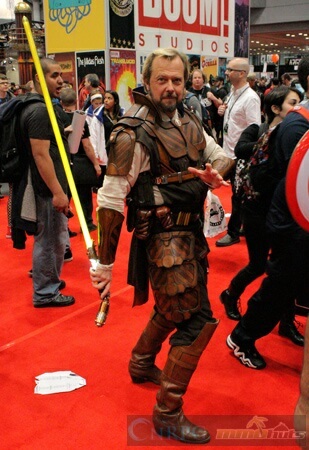 One more day of NYCC to go! Keep an eye out for the final write-up soon.